Hydrolysis is the breaking down of a chemical compound into two or more simpler compounds by reacting with water. The proteins, fats, and complex carbohydrates in food are broken down in the body by hydrolysis that is catalyzed by enzymes in the digestive tract. The term comes from the Greek prefix hydro- (meaning water) with lysis (meaning to break apart). Hydrolysis may be considered the reverse of a condensation reaction, in which two molecules combine with each other, producing water as one of the products. 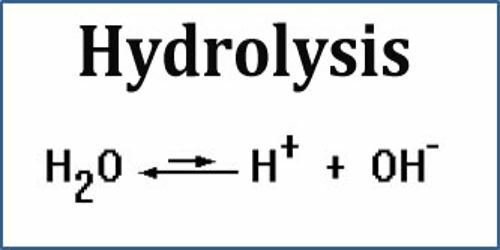 Hydrolysis is quite useful in both biology and chemistry. Biological applications range from breaking sugar molecules down in our body to participating in the release of stored energy from ATP. There are three main types of hydrolysis: salt hydrolysis, acid hydrolysis, and base hydrolysis. Water can act as an acid or a base based on the Brønsted-Lowry acid theory. If it acts as a Bronsted-Lowry acid, the water molecule would donate a proton (H+), also written as a hydronium ion (H3O+). If it acts as a Bronsted-Lowry base, it would accept a proton (H+). An acid hydrolysis reaction is very much the same as an acid dissociation reaction. A reaction with CH3COOH, a weak acid, is similar to an acid-dissociation reaction, and water forms a conjugate base and a hydronium ion. When a weak acid is hydrolyzed, a hydronium ion is produced. 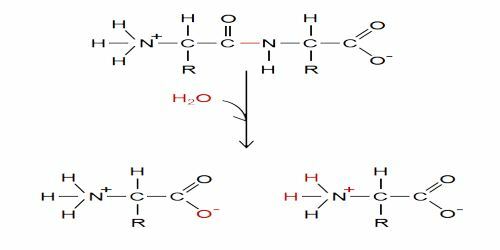 In the hydrolysis of ammonia, the ammonia molecule accepts a proton from the water (i.e., water acts as a Bronsted-Lowry acid), producing a hydroxide anion (OH–). Similar to a basic dissociation reaction, ammonia forms ammonium and a hydroxide from the addition a water molecule. 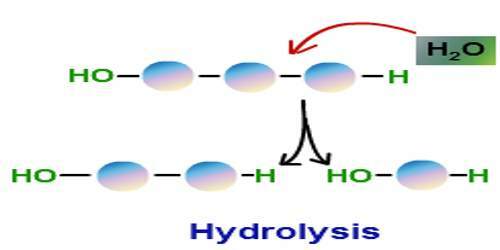 In biological systems, hydrolysis tends to be catalyzed by enzymes. A good example is the hydrolysis of the energy molecule ATP. Catalyzed hydrolysis is also used for digestion of proteins, carbohydrates, and lipids. The energy that is converted from food is stored into ATP molecules (Adenosine Triphosphate). Life requires many processes in order to sustain itself such as cellular respiration, respiration, muscle contraction, distribution of hormones, transmittance of neuro-transmitters in the brain, etc. All of these important processes require an input of energy. To distribute this energy, the energy from the ATP molecules must be released. 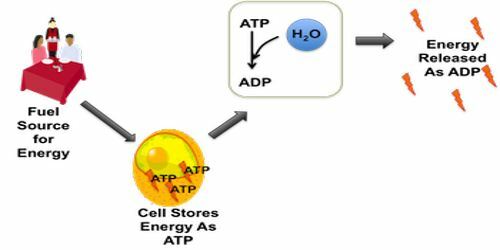 To release the energy stored in the bonds of ATP molecules, hydrolysis must occur to break a phosphate group off of an ATP molecule, thus releasing energy from the bonds. ATP now becomes ADP (Adenosine Diphosphate) from losing a phosphate group through hydrolysis.